Where most games try and capture the awe and wonder of their audience in the opening moments of gameplay, Telltale’s Guardians of the Galaxy does so in the start menu. The film released back in 2014 was a breakaway hit for two distinct reasons, its lovable and lovely opposed cast of rogues and heroes, and its soundtrack. It rocked out cinema screens worldwide with its bombastic retro pop, and while the game doesn’t have the rights to the Awesome Mixtape that we all undoubtedly have on Spotify, it does have the equally enjoyable vintage anthems of the ‘Rad Mixtape’, which immediately hypnotise the player as the opening chords play on the menu. From there, you’ll get to experience life as a reformed space pirate, hell bent on having fun and occasionally saving people. If you’ve ever played a Telltale game, you already know how the game works. Gameplay is broken up into a series of dramatic conversations with branching dialogue options, and action sequences that play out in spectacular comic fashion. You won’t be needing any particular skills to be StarLord, bar some basic hand-eye coordination, and a bad sense of humor. 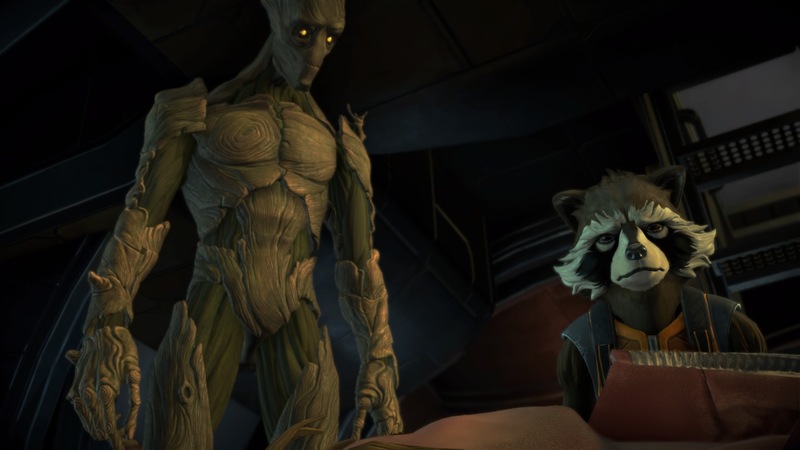 Guardians of the Galaxy like any other Telltale game is all about the story. With over half a dozen franchises under their belt, Telltale have established a fun, well-paced formula. And like so many of the other titles, Telltale does a fantastic job of delving into the well-established universe and making their own story out of it. I don’t want to spoil anything for fans of the comics, films or the games in general, but the story is immediately and dramatically different from what you might expect of the Marvel universe. Where Guardians struggles, much like the recent adventures of Batman, is the overt characterization of the central cast. We already know the dynamic conflicts, drama, and intrigues of the Guardians, and more importantly, we already know what the character of Peter Quill is. He’s a lovable rogue, a bit of a buffoon and nicer than he tries to appear. Which is great, until you start playing as him. As I flirted with Gamora, bantered with Rocket and waxed lyrical with Groot, I pondered what StarLord would say, not what I wanted him to say. While roleplaying is great fun (shush you dirty minded people), getting to create your own character is half the fun. In Telltale’s the Walking Dead, we got the opportunity to realize our imaginations of Lee. Is he a gentle soul with a violent past? Or is his anger still raging just under the surface? We know StarLord, we love StarLord, but we don’t always want to be StarLord. The rest of the cast, whom we don’t have the responsibility of control, are adorable representations of their film avatars, although they don’t quite capture the same Guardians of the Galaxy magic. Drax, a personal favorite, doesn’t reach the same cute heights of non-understanding that he does in the film, and the conflict I found between Rocket and StarLord feels almost entirely forced. What started as a simple quip turned into genuine raccoon anger. Had these characters been new to me, this experience would have probably been better, but these are only mild irritations in what is shaping up to be an exciting space quest. And the action sequences are getting so much more enjoyable from Telltale. For the fans that have experienced the janky, wobbly and shuttering horror of combat in the Walking Dead, this game is a dream. Sequences seamlessly flow into one another, with the quick time events offering a nice variety of movements that organically fit with the action. Although whenever StarLord unholsters his dual pistols, the player does nothing but mindlessly hammer the triggers for a couple of boring moments. But these missteps aside, it is fun, frantic and fast. Peter Quill is a quick-witted man, and it is fun to pretend to be as funny as him, even unintentionally so. Despite his lack of resemblance with Chris Pratt, he is exactly how StarLord should be because we can make him that way. Maybe stronger willed people than I might be able to try playing Peter Quill as a different character, but not I. 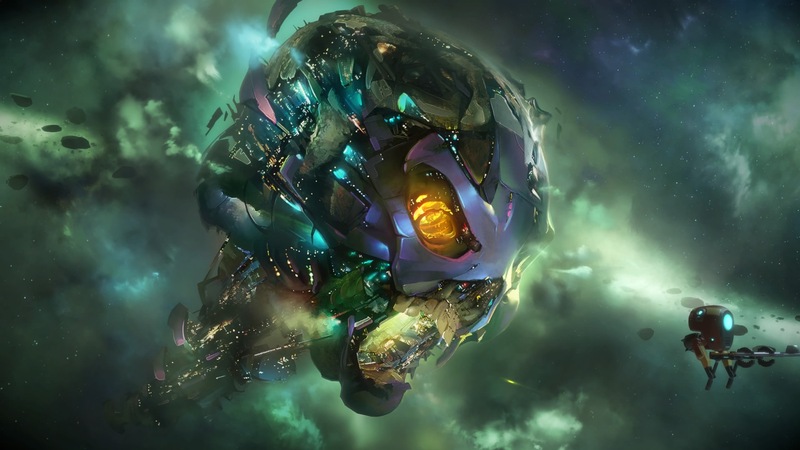 But Guardians is a game that highlights some of the most exciting work that Telltale has done to date. They have taken a beloved cast of characters and almost captured their essence in video games. That is not a small feat. While it might not live up to the much-hyped sequel, this is a fascinating exploration in Marvel’s wackier catalog of heroes. With another handful of episodes yet to come, I’m hoping they can iron out some of the minor issues you’ll encounter here. Hopefully, the shooting galleries will become more engaging and the interactions with Drax just a little funnier. 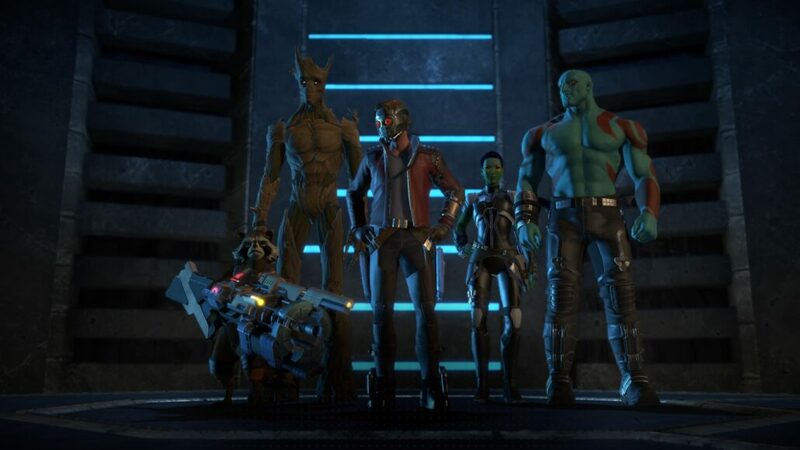 As it stands, Telltale’s Guardians of the Galaxy – Episode One is a solid foundation, with a great soundtrack. Reviewed on PlayStation 4. You can buy the whole season for PlayStation 4 or Xbox One via Amazon. Episode One - Tangled Up in Blue is not perfect, much like the gang of the Guardians of the Galaxy, but with plenty of comedy, action and interesting stories, this might yet turn into one of Telltale's most beloved series.